One of my New Year’s resolutions this year was to cook something Polish once a month. Since yesterday was Fat Thursday in Poland, it was a perfect time to make Polish pączki. Let me explain. Fat Thursday is the last Thursday before the Lent, which is celebrated in Poland by eating enormous amounts of Polish doughnuts called pączki. Pączki are similar to American jelly-filled doughnuts, but unlike the American doughnuts, which are usually very sweet and filled with lots of jelly after frying, Polish doughnuts are filled with only a little of the filling which is placed inside the doughnut before it is fried. The most common filling is jam, but there are places in Poland where you can also buy pączki filled with advocaat custard. My grandmother, who makes delicious doughnuts, usually fills them with powidła, which is a common filling for homemade doughnuts. 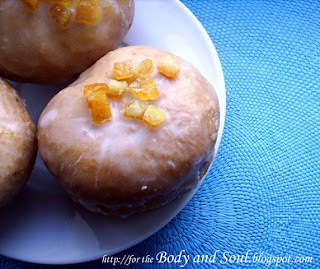 Pączki are usually covered with powdered sugar or icing and, sometimes, topped with candied orange peel. Even though pączki are available in Poland all year-round, Fat Thursday is actually the only time in the year when I eat some. My favorite doughnuts are the ones filled with rose hip jam, which is the most popular Fat-Thursday filling. I usually buy the doughnuts in a bakery, but since Tartelette and Peabody have organized Time to Make the Doughnuts food blog event this year, I thought it’s a great opportunity to learn how to make Polish doughnuts myself. They’re probably longer to make and harder to fill than American doughnuts, but believe me that the effort is rewarding. My doughnuts came out wonderful, very light, tender and absolutely delicious!!! A few notes to the recipe: The recipe calls for fresh yeast, if you have trouble finding them, I suspect active dry yeast might work well, (I haven’t tried it yet). While searching the Internet for Polish doughnuts recipe, I have found many simplified recipes which use less egg yolks and no alcohol. Do not reduce the amount of the egg yolks!!! The doughnuts which contain more yolks eggs absorb less oil. Also alcohol when incorporated into doughnut dough reduces the absorption of frying oil. Most of Polish doughnut recipes call for rectified spirit, feel free to use vodka or rum instead. Before frying, make sure the oil is hot enough. Test the temperature by frying a piece of dough; if it floats up immediately and turns golden quickly, you can start frying. To keep the oil temperature constant while frying, fry only a few doughnuts at a time. Crowding will lower the oil’s temperature and produce greasy doughnuts. I filled my doughnuts with rose hip jam, but feel free to use the filling of your choice. 1. Heat 250 ml (1 cup) of the milk over low heat until slightly warm, but not hot (too hot milk will kill the yeast). 2. Crumble the yeast in a large bowl. Add the heated milk, 1 tablespoon of the sugar and 5 tablespoons of the flour. Stir to combine and dissolve. Cover with dishtowel and set aside in a warm place. Let rise until spongy. 3. Place the egg yolks, sugar, vanilla sugar, salt and 2 tbsp of slightly warm (but not hot) water in the bowl of an electric mixer and beat until fluffy and pale. 4. Add the egg mixture, the remaining milk, the alcohol, and orange rind to the yeast mixture and stir until all the ingredients are well combined. 5. Pour the liquid into the sifted flour and stir with a wooden spoon until well combined. If the mixture is too dry add more milk. 6.Knead the dough by hand for at least 20 minutes or until smooth and soft. The softer the doughnut dough, the more tender the doughnuts will be. 7. Gradually add the melted butter and continue kneading until the dough incorporates it and is no longer sticky. 8. Shape the dough into a ball. Transfer to a large bowl, cover with a dishtowel and leave in a warm place until doubled (about 1 hour). 9. Place half of the dough on a lightly floured work surface. Sprinkle the dough lightly with flour and, using a rolling pin, roll to a thickness of 1/2-inch. 10. Using a drinking glass or round cookie cutter, cut circles (approximately 3 inches in diameter). 11. Spoon about 3/4 teaspoon of the filling into the center of each circle. Raise edges of dough and pinch together over filling, then roll between palms snowball fashion to form balls. 12. Transfer the doughnuts to a parchment lined baking sheet (do not flour the baking sheet). Cover with a dishtowel, and let rise in warm place until doubled. 13. Repeat until all the dough has been used. 14. Heat the oil over medium heat in a deep heavy frying pan. Use enough oil that doughnuts can float freely (about 2,5 inches). Test the temperature by frying a small piece of dough; it should bubble and float up immediately. 15. Fry 3 doughnuts at a time. Cook on each side until golden brown, about 2-3 minutes per side. Then remove to drain on paper towels. 16. 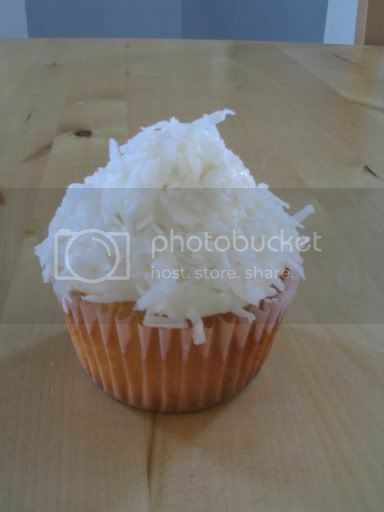 To make the icing, sift icing sugar into a bowl. Mix through 2 tablespoon lemon juice, then gradually add enough water to obtaining a mixture with a suitable consistency to spread. Spread over the doughnuts with a brush. Top each of the doughnuts with candied orange peel. Karolciu, pozwoliłam sobie ściągnąć od Ciebie pomysł z tłumaczeniem przepisów na jęz. ojczysty:) Mam nadzieję, że nie masz mi za złe? I have been wanting to make these for a long time. Maybe this weekend...Thanks for your entry, they are picture perfect! Look how plump and lovely those are. I would tear them up right away. These look delectable with the candied orange on top. I would love to try the ones filled with advocaat custard too. I'm sold! These look *delicious*!!! I love the sound of custard filled ones! Yum!!! Your paczki are simply marvelous! Bravo! The best paczki have WILD ROSE PETAL flavored jam, NOT ROSE HIP flavored jam. Entirely different flavors. Anonymous: Have you tried my recipe? They're round, not flatten and the dough tastes exactly how you described it. Also, the orange rind in the recipe is optional. Sadly, I don't know what could be the filling. The advocaat custard I've mentioned in my post, doesn't taste alcohol (it's only the flavoring, not the real liquor), but still, the color is yellowish and tastes sweet, so I guess it's not the filling you've tried. Just thought I'd comment to say I used your recipe yesterday. They were just like the paczki i used to get from the polish bakery. I only made a quarter of the quantity as there were only two of us to eat them. It made plenty.